Rick Mirer was a star quarterback at Notre Dame and the number 2 pick in the entire NFL draft in 1993. Despite never being effective as a pro, he lasted 11 years in the league. 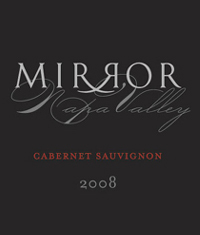 Now he's one of many celebrities involved in the wine business, as head of Mirror Wine Company in St. Helena. I sampled Mirror's two wines recently but decided to blog about Mirer and the winery anyway, mainly for football fans wondering what he's up to now. Mirer said he got into wine during his four seasons in the Bay Area, as a backup QB for the 49ers in 2000 and '01 and a backup for the Raiders in '02 and '03. The 2002 Raiders made it to the Super Bowl, but Mirer never took a snap that season. The Raiders trained in Napa, which gave Mirer the opportunity to make friends with people like Jeff Smith, the owner of Hourglass and a huge Raiders fan. Smith and winemaker Rob Lawson were looking for a man to run the offense for a wine project they had in mind, taking Cabernet Sauvignon grapes from three vineyards in St. Helena and Oakville and turning them into a new brand. "Mirror" was already on Smith's mind, and the connection with Mirer was perfect. There's also a Mirror Sauvignon Blanc. I do not recommend either. There's nothing wrong with the '08 Cab: it's one-dimensional, ripe red fruit that could be anything from anywhere, but there's no reason to spend $75 for such a wine. The '10 Sauv Blanc ($24) is lacking in acidity and fruit flavors. Me: Do you own a vineyard? Mirer: We source the fruit from places we've had contracts with from the beginning. We have 3 different Cab sources we're not at liberty to talk about specifically, but they're in St. Helena and Oakville. We're also doing a Howell Mountain Cabernet that's an '09 vintage that we're going to release a year from now. It will be 120 cases of just Howell Mountain stuff, all single vineyard. We're at 600 cases of Cab, 400 cases of Sauvignon Blanc. That's not a lot, but we were at 500 in '05. I can't see it going bigger than 3 or 4 thousand cases at some point. We're just waiting for the demand. It's good to be small, we can concentrate on relationships. Me: Why don't you push the football angle on the label? Mirer: We didn't want it to be about that. There's enough goofy sports guy wines. I didn't want to push that side of it. We need it to be accepted by our peers and the other wines in the price category. Me: But you do hear from football fans when you're out promoting the wine, right? Mirer: I'll hear from all kinds of people who stumble across it, whether it's Notre Dame or different teams. I'll hear from guys I played with, guys who are coaching all over the place. Me: Have you considered coaching? Mirer: I'm not interested in devoting the time. I have three young boys and I coach them. I think it's enough. That's where I get my fix. I didn't want to put my family through the moving. Me: What was your favorite game? 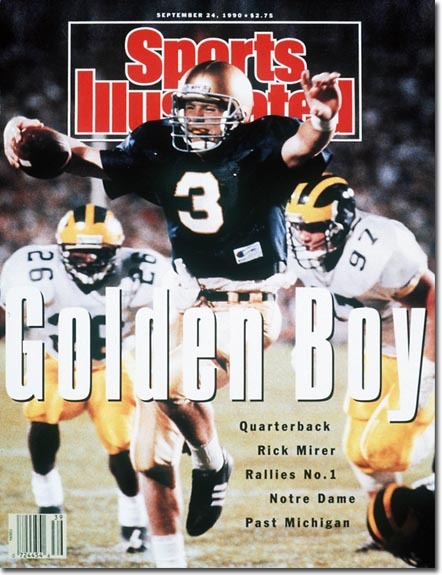 Mirer: Probably the most satisfying one was when we beat Penn State (in 1992). Back then you didn't have ties and overtime. We went for two when we were down by one. That was my last game at home. That was very satisfying, to walk off that field with my classmates. That one felt good. Me: What was your lowest ebb? Mirer: I had certain opportunities. In New York with the Jets, the '99 season, expectations were high. We were considered one of the teams that was going to compete for a championship. A few guys got hurt and I was in there, and trying to take over, and it's New York. That's hard. I enjoyed coming to the Bay Area. The Raider Super Bowl run was fun. We didn't win the game, but it was fun to go to the game and see the attention the team has on them. That was kind of a reward for some of the seasons that were not so easy. I enjoyed being in the Raiders training camp in Napa. I had three years in a row to spend a lot of time there and get to know a lot more people. The longer I was there, the more I liked it. Food and wine was more important to me then than it was in my 20s. Because of that I have an opportunity that I might not have had. Me: How much input do you have into the style of wine? Mirer: (The style) hasn't changed much. I liked it from the start. We don't have to magic it up. It performs. If we keep the sources and we keep the style, we'll have people who come back every year. The Howell Mountain's going to be bigger, more complex, more of a wine for aging. I'm not going to tell you I'm giving Rob input on blending. I could, but I don't think he'd listen. Rob and Jeff Smith had started putting the project together before I was involved. I just stumbled into an unbelievable project for a new guy. They just needed a brand and a direction and somebody to lead the way. "We don't have to magic it up. It performs." Performs like 2 interceptions in the 4th to lose it? I almost didn't open this link, assuming it would be another press release "news" article about a celebrity wine investor. Thanks for not doing that. As an aside, where did you end up eating while in Sacramento last week? Kurt: Aioli and Ella's. Liked both. The octopus/potato tapas at Aioli was fantastic.